There has been a gap between tablets and smartphones that has been closing pretty rapidly over the past couple of years. Phones like the Nexus 6 and Galaxy Note try to remain in their own “phone” space, while to many a device of this caliber should be considered a full blown tablet. 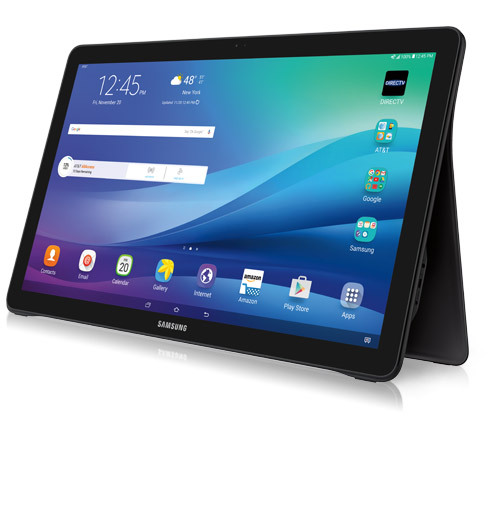 Just as this gap has seemed to come to a complete close, Samsung has decided to attempt to create a new gap in the product space, a tablet that acts more like a monitor. At 18.5″, Samsung’s new “Galaxy View” tablet is a behemoth of a device, targeting one specific category: video consumption. It’s the size of many people’s home computer monitors, but it does much, much more. With this device, Samsung is looking to get video content into places that it would otherwise be difficult to reach. Whether it’s watching cooking videos in the kitchen, or watching sports in the living room, Samsung wants to make traditional content consumption limitations a thing of the the past. The device sports an 18.4″ Full HD screen with 64 GB of storage and a built in kickstand. It’s an interesting concept for sure, but time will tell if this trend will start to ever take off. If you’re interested, you can pick it up from AT&T this Friday, November 20th.